It's Been A Bad Summer For The Political Establishment : It's All Politics The biggest conventional names in American politics — Clinton and Bush — have stumbled this summer as Americans look to channel their frustrations through unconventional outsiders. 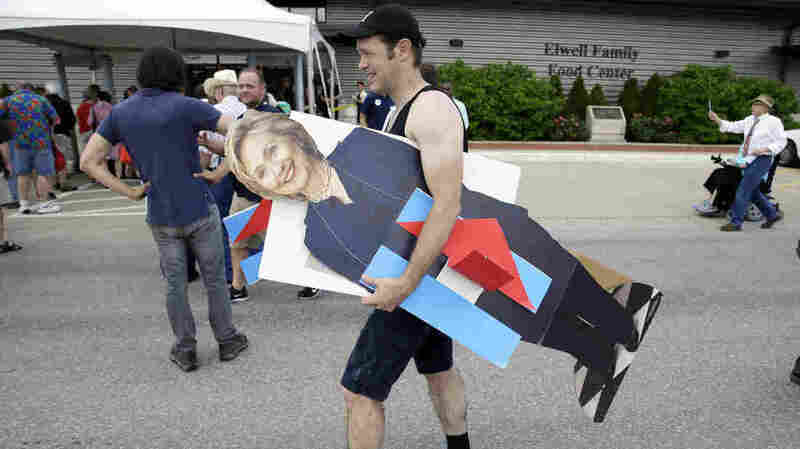 A man carries a cardboard cutout of Hillary Clinton in Des Moines, Iowa. Clinton and other traditional candidates have struggled to breakthrough as outsiders have captured the attention this summer. Everyone should be on notice to look out for the unexpected this year in politics. What usually happens might not be the case this time around. "[T]he traditional candidates cannot be secure in waiting for the voters to come to them. If [Jeb] Bush and [Hillary] Clinton and the others succumb to thinking that the world has spun out of its axis this summer and will eventually return to a familiar normal, they could be missing part of the message of this strange year. Something is stirring and they had better be ready." New NBC/Marist polls out Sunday of Iowa and New Hampshire add some data to these points. 1. It's all Trump right now: The real-estate mogul billionaire leads in both Iowa and New Hampshire — and, in the Granite State, by a lot. 2. Ben Carson has emerged as top-tier: The retired neurosurgeon is in second place in Iowa by just 7 points and in third place in New Hampshire with 11 percent. Ohio Gov. John Kasich is second with 12 percent. 3. Jeb Bush and Scott Walker have cratered: Bush is down to just 8 percent in New Hampshire, down from 14 percent in July and 18 percent in February. Walker, the Wisconsin governor, is at 5 percent in Iowa. Let me repeat that: 5 percent. He was at 19 percent and in first place in July. 4. Bernie Sanders is a big problem for Hillary Clinton: The Vermont independent, who caucuses with the Democrats in the Senate, is up in New Hampshire by 11 points, 49 to 38 percent. It's the first good poll to show Sanders leading in New Hampshire, and gives real proof to his staying power — even if, as he admitted this past week, "We are growing much faster than we have the infrastructure to organize. So what we are doing now is hiring a lot of people. We have now dozens of people on the ground here in Iowa. Great crowds are wonderful but that does not necessarily translate into votes." Sanders raised $15 million in his first reporting period. That will be enough for him to start to build a team that can organize in the early states. Clinton, by the way, is up 11 in Iowa in this poll, too, which is wider than the 7 points she was up in the Des Moines Register/Bloomberg Iowa poll. But with polls, especially early ones, don't read into a 4-point difference. What's important is the trend. And the trend is — Sanders gaining. 5. Clinton's favorability rating is still pitiful: She has just a 36 to 60 percent favorable to unfavorable rating among New Hampshire registered voters and 32 to 61 among Iowans. 6. Joe Biden and Sanders are both better liked: Biden does better against Bush and Trump than Clinton in both states. Clinton loses (yes, loses) to Trump in Iowa. 7. Clinton has about the same favorable rating as ...: Wait for it ... Donald Trump. Walker and Bush are also equally as bad as Clinton's favorability ratings. That gives some credence to her team's assertion that if she makes it through the Democratic primary, the fact is elections are choices, and her ratings are as bad as other conventional politicians, and at least one unconventional one — Trump, who few outside his supporters think can win a general election. The bottom line here: it's been a miserable summer for the establishment and one-time front-runners — Clinton, Bush, Walker have all taken varying degrees of tumbles. Right now, what was up is down and what was down is up. Anti-establishment frustration and anger has been a theme since the 2010 midterm elections and the rise of the tea party. But with no incumbent President Obama on the ballot with his coalition and all that it means, it's a free-for-all. This isn't a good year for a conventional pol. At the end of the day, the big question question is: Can an unconventional pol win in a conventional system? The system isn't designed for an outsider to win. But this year might test that big time.